Sometimes the Mediterranean is whipped into life by the wind and on those days the surfers come out in force and have a great time. Parfois, la Méditerranée est agitée par le vent et ces jours-là, les surfeurs viennent en force et prennent du bon temps. Wow! That is a great shot, Jilly. 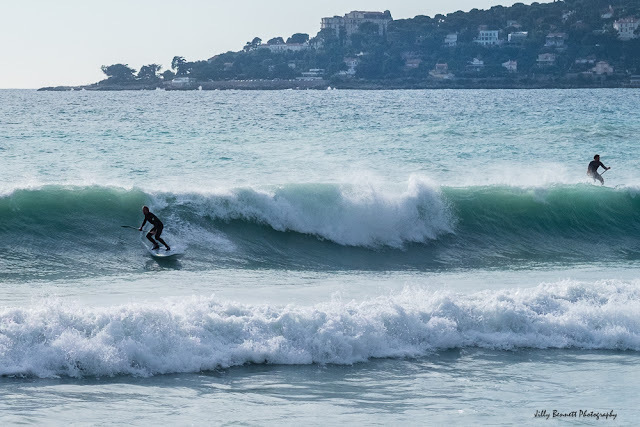 It is very rare to see surfing on Menton's beaches. Surfers must be incredible weather-watchers to know when to show up for this. I've never seen the Mediterranean like that. We are not likely to see such surf on the Pacific in Costa Rica next month. You caught a good moment. Surfing the Med, wow, that's pretty unusual! I saw a surfer trying to ride tiny (but very clean) waves in les Saintes Maries de la Mer yesterday. He couldn't stay up more than a couple of seconds, he was already at the end of the wave.